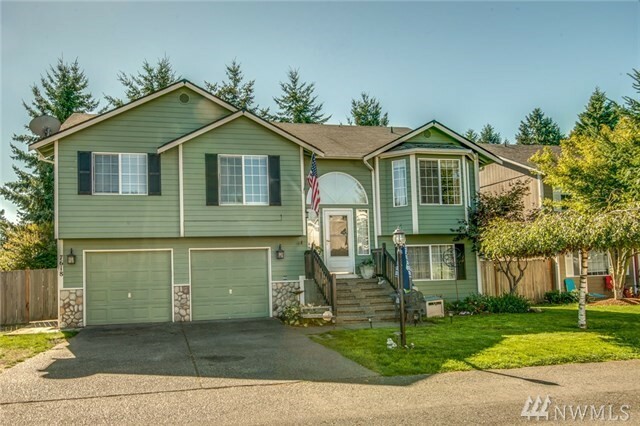 2,402 sq ft; lot: 6599 sq ft - MLS# 1409506 Courtesy of John L. Scott, Inc.
5 BEDROOM 3 BATH 2402 SQFT HOME In Puyallup! Laminate Floors Throughout Main Level, Vaulted Living Room Ceiling With Gas Fireplace, Open Oak Kitchen With Formal Dining, A Breakfast Nook and SS Appliances. Upper Deck Has Stairs To A Fully Fenced Back Yard With Large Storage Shed. Downstairs Features A Large Family Room, Two More Bedrooms, Full Bath, Laundry Room and Slider To A Back Patio Under The Deck. This Well Maintained Neighborhood Has A Park and Is Close To All Kinds Of Shopping Needs. Selling Office: Skyline Properties, Inc.